Company: Eric S. Wiener, Esq. 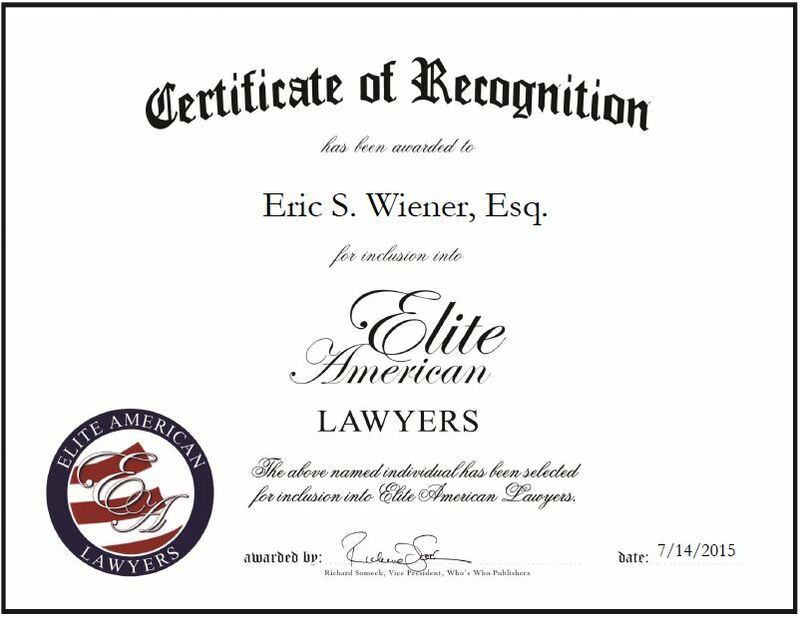 Arlington, VA, July 14, 2015, Eric S. Wiener, Esq., Attorney at Eric S. Wiener, Esq., has been recognized by Elite American Lawyers for dedication, achievement and leadership in workers’ compensation. Mr. Wiener considers himself to be the best worker’s compensation attorney in Virginia. He has been developing his skills in the area for more than 25 years and has garnered a stellar reputation for his work in the field. A PRR Peer Review Rated Attorney through Martindale Hubbell, Mr. Wiener represents clients with workers’ compensation claims, injury claims and survivor claims. He also handles administrative work, works on a wide range of personal injury cases, and provides clients with small business advice. Aside from running his firm, Mr. Wiener is also dedicated to teaching other attorneys in workers’ compensation through the National Business Institute and Lawline. Mr. Wiener takes great pride in his work and enjoys being an advocate for others. Moving forward, he plans to continue building the practice. He hopes to become the go-to attorney for workers’ compensation. Contact Eric S. Wiener, Esq. This entry was posted in Workers' Compensation and tagged Lawline, personal injuries, small business advice, survivor claims, teaching. Bookmark the permalink.